Thanksgiving’s all about family gatherings, right? Well, the National Dog Show Presented by Purina Nov. 18-19 in Philadelphia is taking it to heart and serving up plenty of family, too, albeit a bit early. 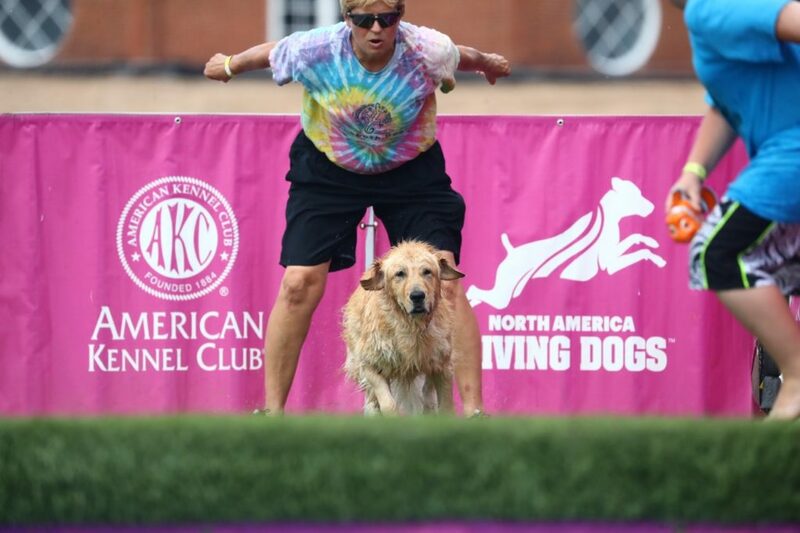 Nancy Lewine, Jenny Cochran and GoldenSoul Dogs, of Harleysville, Pa., have entered three generations of Golden Retrievers at the benched event, which is virtually on their home turf – 30 minutes – away. Daddy Tracker and daughter Sage display wins from the Wrightstown, Penn., shows in 2014. Sage won 4-6-month Sporting Group 1 and Tracker took Best of Breed. Photo courtesy Nancy Lewine. There’s Tracker, 6, his daughter, Sage, 4, and granddaughter, Ariel, 8 months, who will be gaited by Heather and Zack Helmer, of Queenstown, Md., their regular professional handlers. 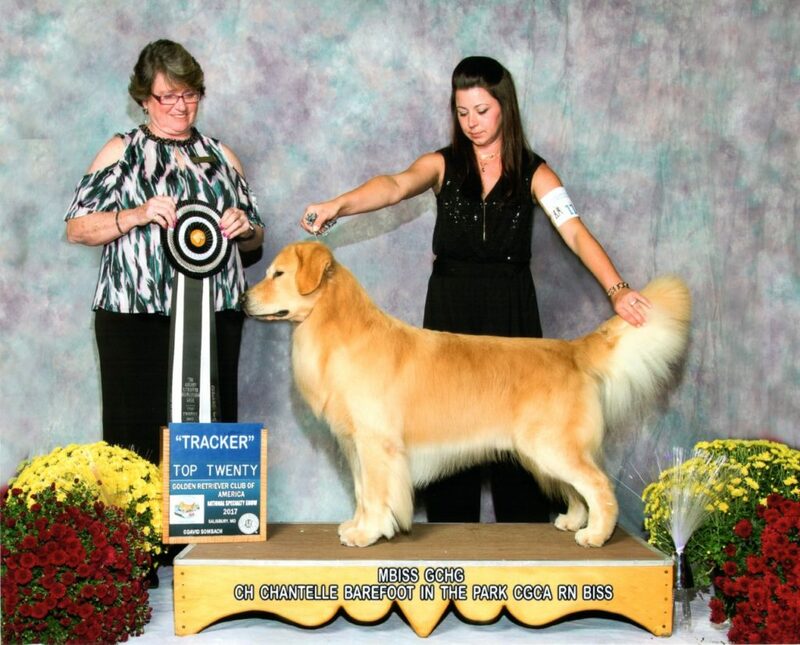 Lewine became involved with Golden Retrievers in 1979 and bred only two litters over the following two decades. 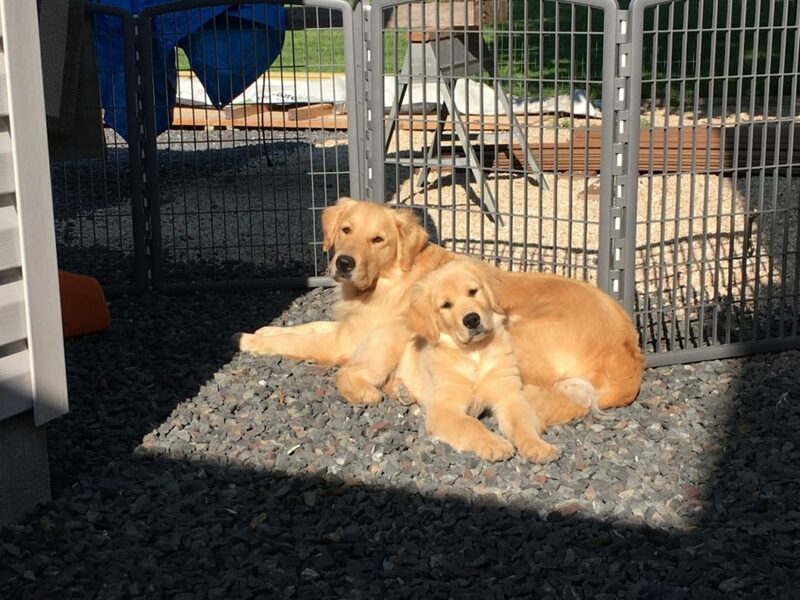 After the passing of two Goldens a week apart in 2011, she and her partner, Cochran, resumed breeding, training and handling and have been deeply involved since. Cochran previously owned Newfoundlands and attempted to owner-handle them decades ago, ultimately becoming frustrated and decided to set her show dreams aside. 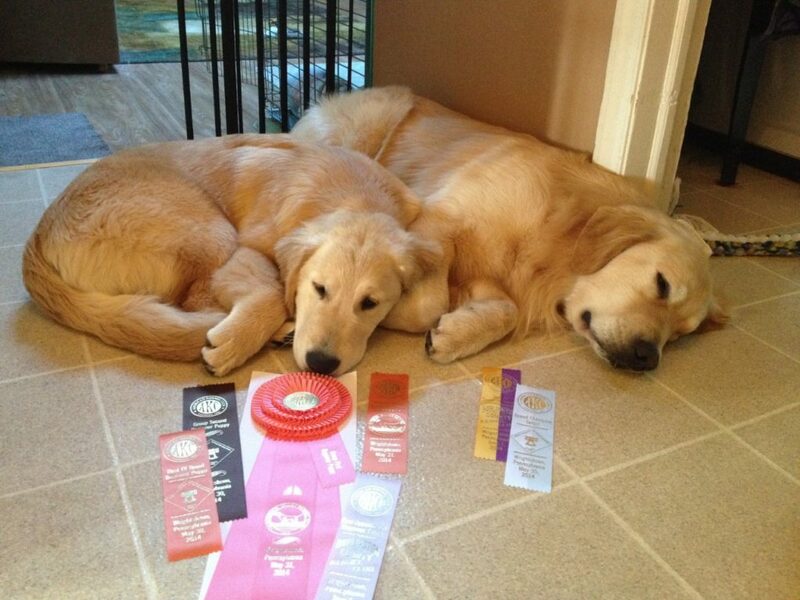 After the deaths of the two Goldens, they found and adopted Tracker and five months later, Skye, which have become their show and foundation dogs. “We knew the pedigrees were a good match from the beginning,” says Lewine, an organizational development consultant who helps small- to mid-size firms grow while mitigating their normal growing pains. Fortunately, this job allows her to work from home. Lewine, who refers to herself as the GoldenSoul “executive producer,” oversees the breeding program, show strategy/schedule/handler relationship, advertising strategy and finances. She also produces the website content, interviews prospective puppy purchasers, grooms the dogs and oversees their medical needs. Cochran, a teacher, coordinates training and titling of dogs in performance events and only recently started in conformation. She will not, however, replace the Helmers. Cochran creates the structure for raising and maintaining the pack and manages the educational support for puppy families with Google docs online. The 6-year-old Tracker is in the Golden Retriever Top 20 this year for the second consecutive year. Photo by David Sombach. 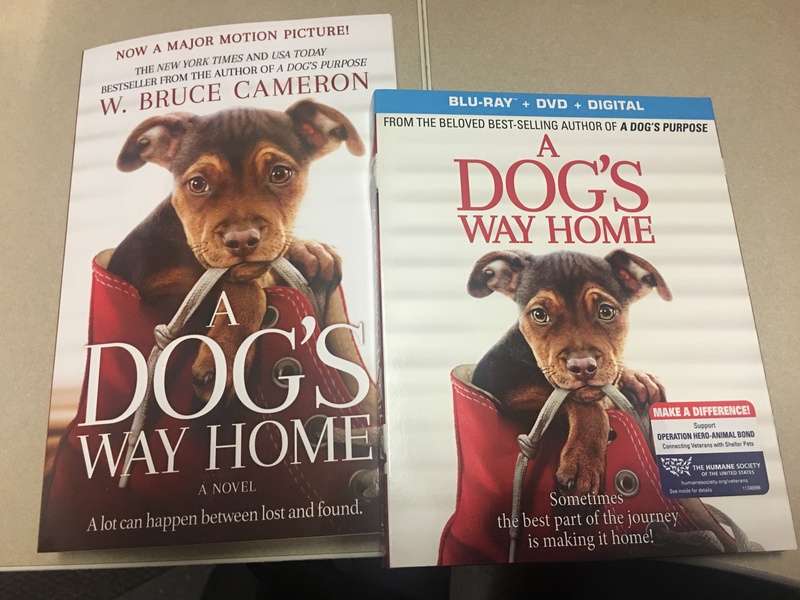 She searched the newspaper in in Madison, N.J., while attending grad school at Fairleigh Dickinson University and found a puppy available. She brought Brandy home on Christmas break, labeled her “my first child” and the rest is history. Fast forward and today Lewine and Cochran attend dog shows almost every weekend, chiefly traveling regionally. Lewine estimates she has attended about 500 shows since 2011, when the pair started with Tracker. In the process, she has established many relationships and studied the breed intensely as well as the sport of showmanship. Early on, her dream was for Tracker to be a Top 20 dog. Five years later, he was gaiting around the ring in that upper echelon. “It’s been a ton of work and plenty of drama,” she concedes, and Top 20 status in back-to-back years (2016-2017). Mama Sage and baby Ariel, 3 months, find soothing time together sunbathing. Photo courtesy Nancy Lewine. She took Best in Show at The National Dog Show in 2014 with Nathan, a 4-year-old Bloodhound and a huge crowd favorite. “Tracker’s showmanship and fun games he likes to play in the ring keep him in the eyes of the judge. The breed is supposed to be happy, but the challenge for the handler is that there are so many types of Goldens, and if a judge doesn’t like his type, we must show off a strong point that the judge that day might like. Depending on their number of entries per show, sometimes the husband/wife team are uncertain who will be showing which dog in the breed and/or group rings. 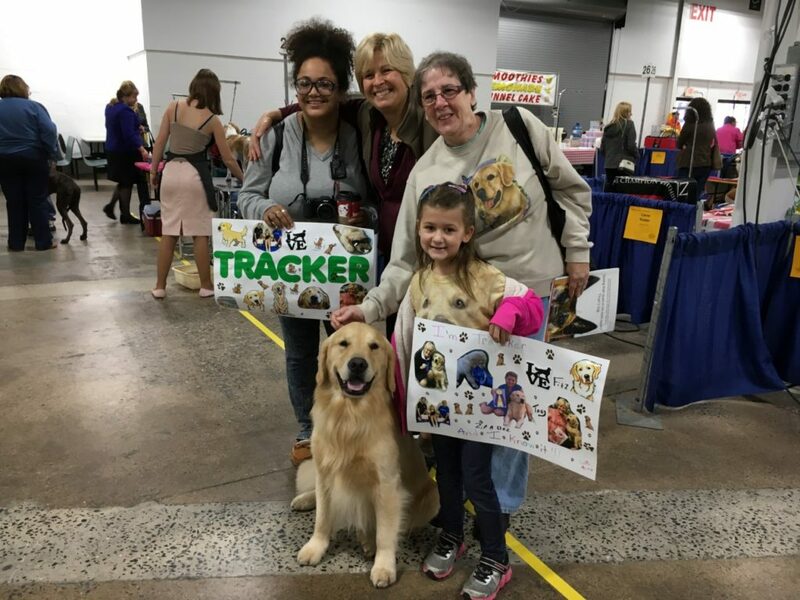 Tracker hangs out with his SuperFans at the 2016 National Dog Show in Philadelphia. Standing, from left to right, are Nyah King, Cochran and Phyllis Miles King. In front are Tracker and Abby King. Photo courtesy Nancy Lewine. Which begs the question: Does Tracker and Ariel bond or perform better for one than the other? With swagger and verve, all three compete outside the conformation right, too. Tracker has done rally, obedience, tracking, trick and lure coursing; Sage has performed in four of those sports, plus dock diving; Ariel just became old enough to earn her dock diving title and will pursue lure coursing when she’s a year old. Now, just in case you’re wondering: A Golden Retriever has never won The National Dog Show, which dates back to 1879 and has been held continuously in Philadelphia since 1933. But there’s always hope. Remember, the Chicago Cubs won the 2016 World Series, their first since 1908.